I tried to make the chocolate cake using the recipe (sent to me by reader Asunta, thanks!) that was apparently used by Kookie Monster, and possibly, the Shell gas station cake lady, Mrs. Polly. The results were a bit disappointing. The cake was on the dry side and I screwed up the sugar so my version wasn’t too sweet but the original recipe would be. I still think it lacked some fat, and some vegetable oil or mayonnaise would do the trick. I don’t think it is the recipe that will yield the Mrs. Polly equivalent cake. But nevertheless, it is an easy recipe and yields a basic and economical chocolate cake. If you buy a large container of Hershey’s cocoa, they have a recipe on the back of the can and frankly, it yields a pretty darned good cake or cupcake. 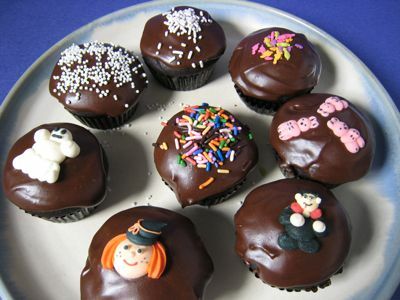 Again, considering the ingredients, the results are not bad at all… For guests this afternoon, I prepared two dozen Hershey’s chocolate cupcakes with sickly sweet chocolate and confectioners sugar icing and halloween themed decor. And no, I did not make the decor myself, it’s store bought from Sweetcraft (nice shop, nice selection of goods, but the MOST inane staff sometimes…almost enough to turn me off to ever going back there again) on Boni Avenue in Mandaluyong. 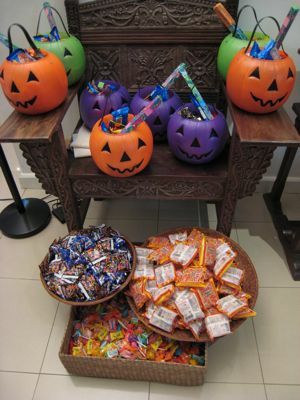 We are all set at home for the onslaught of costumed bulilits and adults alike, with enough loot pumpkins for all the guests (including all the kids of the crew) and enough candy for 2,000 trick or treaters… BRING THEM ON! Happy Halloween to you all!!! I think you meant Sweetcraft– where I missed you by a mere 30 minutes! Those are great looking cupcakes. I like the headless topper best. Risa, thanks, I have changed the post…you are right. Those cupcakes look great! 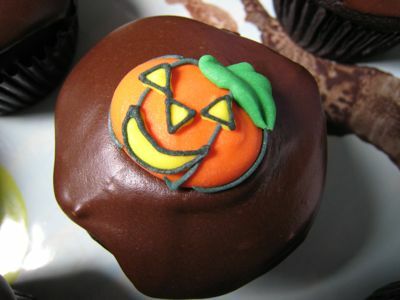 Maybe I should make my own cupcakes for Halloween hehehe. I’ve only been to Sweetcraft once, about 18 months ago. They don’t provide the best service (except if you text the owner), but they do have a great selection of baking supplies. You asked before where to find good pandesal in cebu. Well, i’ve found some reeelly good ones at GUSTAVIAN along Ma. Luisa Road in Banilad. They cost P10 each for the plain and a little more for the whole wheat. But they are HUGE, one can occupy the entire of my palm. And they are not airy or fluffy. They have a nice filling bite and frankly, one is enough for me. Whereas, with the corner bakery variety, I can eat 20 pieces and still go hungry. I’m thinking of buying the limited edition Krispy Kreme Halloween doughnuts but the cost is holding me back. 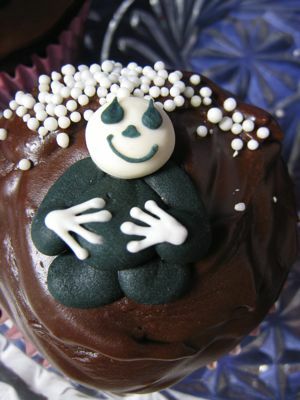 Your cupcakes look nice, if only I could make my own. Wow! Can I drop by your place and have some of those loot pumpkins? The cupcakes look great. Happy halloween, Marketman! Here in the boondocks, they sing a carol called “pangunguluwa” and ask for a donation so they can buy candles for their dead the next day. bdw, marketman i hope ul kip ur word regarding posting asunta’s recipe once u’ve tried making it. mia, I just tried it for the cupcakes, and it was a bit dry, I actually liked the recipe on the back of the Hershey’s tin better… still want the recipe? me too MM.. i would want to try making that chocolate cake.. and maybe twist it a little for added moisture.. the one’s i’ve tried aren’t really nice.. it’s just like the one’s sold in the corner bakery sans the fudge that i make myself.. i hope you can also send me a copy..
i hope to have the time to make those cupcakes.. my kids would surely enjoy frosting and decorating them.. unless they decide to eat the frosting first.. hehehe! Wow, what a sight!Grabe ang sarap tingnan ng cupcakes mo. By the way, I would like to tell you that I’ve been using Hintz Chocolate for my chocolate cake and it really gives a good moist chocolate cake, incomparable with hershey’s or even bensdorf or valrona (is this right?). Yun nga lang we get it from the middle east pa, but it’s from germany. if ever mapunta ka sa germany dapat cguro bumili ka ng madaming hintz chocolate. M sure pag na try mo ang hintz, d ka na gagamit pa ng ibang chocolate. In an electric mixing bowl, cream 3/4 cup butter, 3 and 3/4 cup sugar and 6 whole eggs until well blended. In another bowl, add 1 cup Hershey’s cocoa, 3 teaspoons of instant coffee and 1 and 1/2 cups of boiling water and mix until smooth. Add this to the creamed butter slowly while the mixer is on to blend all, scraping sides of bowl when necessary. Meanwhile, in another bowl, mix 3 and 1/2 cups flour with 1 teaspoon of baking powder and 3 teaspoons of baking soda. Also prepare 3/4 cup of milk mixed with a teaspoon of vinegar. Next, add half the flour mixture to the chocolate/butter mixture and mix at low speed. Add half of the milk and mix. The remaining half of the flour and then the remaining milk and mix until just blended. Pour into baking pans and place in 320F oven (no temp instructions given) for 25-35 minutes (depending on size of pans used) until just cooked. For the icing, place 12 tablespoons of cocoa in a saucepan, add 2 cups sugar, 2 cups milk, 1 cup water and stir until thickened then take off the heat and add 1/4 cup butter and stir until it is smooth and glossy. (I tried this and it didn’t come out as expected, so I had to make another frosting). tnx for the choco cake recipe marketman and so with asunta.i’ve also tried so many choco cake recipes before but i still can’t catch the right match for my standard.so until that time, i have to keep myself open to any recipe suggestions for this fave cake of mine. any special/personal tips on how to avoid the mistake you did with the frosting? the frosting is quite a familiar recipe and so far my attempts on making it gave me disappointing results too. first, it was too thick beyond spreading consistency once cooled. on my next try, it turned out too runny (coz i was afraid to make the first mistake).there must be a technique on telling when is the right time to keep it off the fire. Just have to comment on your Sweetcraft experience. I’ve been there a couple of times but have no plans of going back again. They were supposed to “launch” new packaging materials, like cupcake cups and other really nice stuff but it hasn’t been available for the longest time. The reason they always give is that “nasa customs pa po, baka next week dumating na”. I’ve heard that reason a hundred times that I stopped asking altogether. I can’t use them as my regular supplier as availability of their stocks are so erratic. Masisira lang ang business ko sa kanila! They should also check their pricing as some of their items are way too expensive compared to my other suppliers. I have to admit though that they do carry some nice items like the gumpaste candy toppers, although quite expensive if you will use it for your business. Thanks marketman for the recipe. Baked a lot of chocolate cakes and so far i never had a satisfactory result using butter in my chocolate cake recipes. The ones using oil like the hershey recipe most of the time yield a good result at least for my taste. But will still try this one! Let you knw how it turns out. Tnx for the tip! Will definitely get a can of Hershey’s…wondering if the recipe called for oil, nonetheless this is a great tip, very economical! Regarding your Sweetcraft experience, I also had my share of somewhat incompetent service from some of the staff there but quite tolerable (like once being billed erroneously for another customer’s purchases which just happened to be positioned on the counter next to mine). I agree though that some of their items are exorbitantly priced like the Silicone Zone ware which are a few hundred pesos more expensive than the ones I’ve seen in Shopwise. But just in case you haven’t considered it yet, I suggest you check out the stuff at Chocolate Lovers (with their castle-like edifice near Cubao) which has practically the same merchandise plus lots more and the requisite reliable service to boot (or at least for me thus far). By the way, where did you get your pumpkin baskets – Divisoria? They sure look like the ones my sis-in-law got from there. Great-looking Halloween loot goodies you got there – truly ghoul drool-worthy. MM, glad you tried the recipe. Personally I prefer the Black Magic Hershey’s Recipe. But you iced them so well that they look adorable. I have tried many chocolate cake recipes, including my lola’s who was a great baker, but the one that has yielded the best result so far is the One-Bowl Chocolate Cake recipe from Martha Stewart’s Baking Handbook. It is very easy to make and the result is a moist, chocolatey cake. Thanks for trying out and posting Assunta’s recipe as your promised. The cupcake holders and boxes are now available at Sweetcraft. I dropped by last Saturday and they were telling me those are their new items. 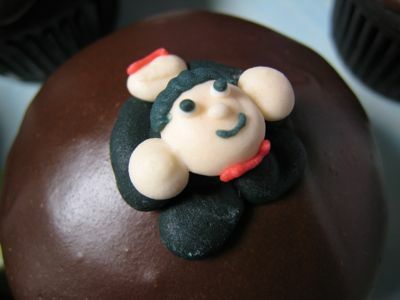 You are right, the gumpaste decorations are cute but pricey. But for occasional homebakers like me, saves us a lot of time and trouble. i agree with the comments on sweetcraft. they have nice items but really poor service. i tried returning a cookie sheet (didn’t fit my oven). i called 2 days after i purchase. i was curtly informed that they had a 3-day return policy. i tried many times to speak to the manager directly to ‘request’ for a 2-day extension as i anticipated that i wouldn’t have the time to return within the period (and since the item wasn’t even perishable!). manager wouldn’t even take my calls (poor customer service right there..). lost a customer for a P145 cookie sheet. Where to buy cupcake foil holder here in manila?..need it badly for my wedding cupcakes..
Hello! I saw an ad of SweetCraft at Yummy Magazine November issue. I am planning to visit the site but I don’t have an idea for their store hours and operations. The big boxes of Philadelphia Cream Cheese and lots of Ferna Flavorings caught my attention that I wanted to visit them. my store po b d2 s tanauan batangas n mismong mabibilhan ng pang baking and cooking?